With Readly you can read How it Works: 60 Second Science and thousands of other magazines on your tablet and smartphone. Get access to all with just one subscription. New releases and back issues – all included. "In this fact-packed guide we introduce fundamental principles in physics, biology and chemistry with clear, concise explanations, infographics, illustrations and home experiments. From the Big Bang to quantum mechanics, and fossils to Wi-Fi, you’ll be up to speed with the latest breakthroughs in no time. 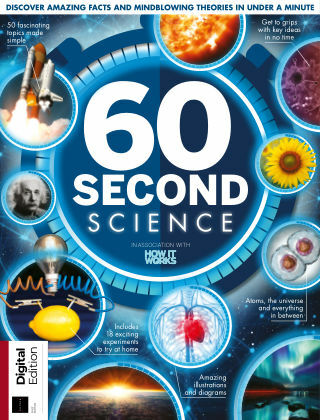 Inside: The Big Bang Atomic structure Electric currents Cell division States of matter Nerve signals Star life cycles How fossils form Doppler shift Respiration Special Relativity General Relativity Magnetism How old are your cells? Moments explained How the heart beats Photosynthesis Planet formation Newton's laws of motion Archimedes' principle Internal combustion engines Bacteria and viruses How light behaves Vitamins and minerals Hydraulic systems Earth's structure The laws of thermodynamics Your body's elements Quantum mechanics Wi-Fi explained The periodic table Inside the human brain Crystallography Nuclear fission and fusion The forces of nature The scale of your body's cells How GPS works Heat transfer How the body digests food Electricity and magnetism Enzymes explained Water transport in plants Sound waves How a clinical trial works Acids and alkalis Human vision The conservation of energy The electromagnetic spectrum Genetic modification Get involved – citizen science projects Plus home experiments to try for yourself: Build a lemon battery circuit Instantly freeze water Make your own fossils Build a model lung Make a compass Build a bridge Make a planetary system model Build a bubble bottle Split the colours of light How to boost your Wi-Fi Make geode crystals Build a teddy bear zip wire Create a solar tower Make an electric motor Build a speaker Make pH paper Create a lolly stick explosion Extract your DNA "